Make your event one to be remembered and appreciated by your community. Experience the sharp crack of a well-done volley of muskets or the deafening boom and smoke of a Civil War cannon. Listen to the old commands on parade while silk Vermont colors with 34 gold stars are carried by the breeze. Walk through a Union encampment, listen to the stories and Civil War songs. Smell coffee boiling on a campfire and see what the common soldier is eating for supper tonight. Hard tack, anyone? Use our honor guard to rededicate a monument, mark a celebration, or act as color guard for a parade. We offer a combination of activities that can be customized to fit your event. We bring a thorough knowledge and interest in Vermont's role in the Civil War that we can share with the public. 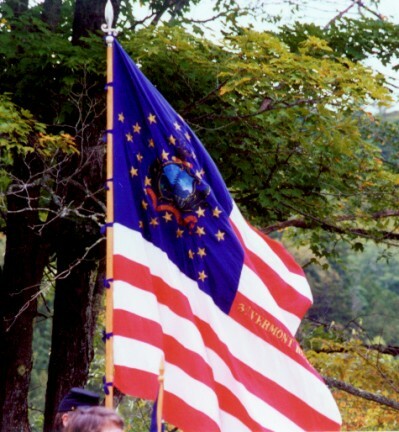 The Vermont Civil War Hemlocks are enthusiasts and living historians of the American Civil War. Formed in 1963, the Hemlocks take their name from the sprig of evergreen which many Vermont troops wore in their cap as an identifying badge. The Hemlocks have grown over the years into an organization which now encompasses several different groups involved in a variety of activities. People from all over Vermont, other states, and even other countries have seen the Hemlocks bring the Civil War era alive at community events in Vermont and at battle re-enactments closer to "the seat of war." Using authentically reproduced uniforms, arms and equipment, the Hemlocks engage in Civil War infantry and artillery drills and camp life, seeking a deeper understanding of the people and events of one of the most fatal and enthralling episodes of American history. The Hemlocks infantry members practice the marching formations and firing drills used by soldiers of the Civil War and carry the same weapons Vermonters carried. They also camp in period tentage: living, eating and sleeping in the style of the soldiers of 130 years ago. In their artillery impression the Hemlocks use two 3 inch wrought iron rifles (sometimes known as ordnance rifles). One of these is an original that saw service in the War. Using a drill based on that employed during the Civil War, but modified for increased safety, the Hemlocks demonstrate the firing of the cannons with blank charges of black powder. Members of the Hemlocks buy their own equipment and donate their time. All fees go to support the group's educational and historic preservation activities, insurance, and special projects undertaken by the organization. Over the last several years, through Vermonters for Battlefield Preservation, the Hemlocks have donated nearly $20,000 on behalf of the people of Vermont to help protect battlefields where Vermont troops played major roles. We actively seek donations and possible purchases of unwanted Civil War items from local towns for preservation and display. We hope to assist some towns in the publication and distribution of their Soldiers Record, a book commonly written by local Civil War veterans and often found today in dark corners of towns' archives. The Hemlocks participate in community events and educational activities around the state of Vermont. We set up a replica of a Civil War campsite, complete with tents, flags, cook fire, and other appropriate equipment. We then engage in the activities of the Civil War soldier: marching, drilling, posting guard, writing letters, cooking meals. Members of the public can walk through the campsite, talk to the soldiers, and learn about the life of the Vermont volunteer. Drills include marching and facing movements, the manual of arms, and infantry firing demonstrations. It may also include artillery demonstrations, as described later. Encampments require at least one-half acre of open, level ground. The Hemlock marching unit is an exciting addition to any parade. Consisting of a color guard of between ten and twenty authentically dressed and equipped Civil War soldiers, usually accompanied by a drummer, they stop periodically during the parade to fire a round of blank charges from their black-powder muskets. (For this reason, the marching unit should not be placed near any horses in the parade.) The artillery is also available for parades. The Hemlocks use a full-scale reproduction 3-inch ordnance rifle and blank black powder charges to demonstrate the loading and firing of these muzzle loaders, which reached the peak of their technological advancement during the war. The report from these blank charges is loud. Artillery demonstrations require an open range at least 100 yards long, and the cannon cannot be aimed in the direction of houses or roadways. We understand that some things have changed since the War. The Hemlocks are covered by $1,000,000 comprehensive liability insurance policy. As an option, your organization may be added to our policy as a "listed insured" for an administrative fee of $100. Your status as a listed insured provides you with more coverage. Either way, the Hemlocks bring this insurance to your event. Our event schedule becomes full fairly early in the season, so the more notice you can provide us, the better chance of the date being available.